Nikon has announced a new lens for it’s line of DX (cropped sensor) cameras, the AF-S DX NIKKOR 55-300mm f/4.5-5.6G ED VR. For reference sake, the 55-300mm will replace the existing Nikkor 55-200mm. This new lens is compatible with the D3100 and D5000 entry-level Nikon DX-format digital-SLR cameras as well as high-end digital-SLR cameras such as the D300S. With a refractive index of 2.0 or higher, the use of a single HRI lens element provides the same benefits as multiple elements made of standard optical glass. In addition, as this single lens element also compensates for focal plane curvature and spherical aberration, the lens itself could be made smaller and lighter yet still offer 5.5x magnification and support for super-telephoto shooting at up to 300 mm. It exhibits excellent contrast and sharp rendering throughout the entire frame even at maximum aperture. The benefits of vibration reduction are best demonstrated with super-telephoto shooting. This feature stabilises the view through the viewfinder for simpler focusing. 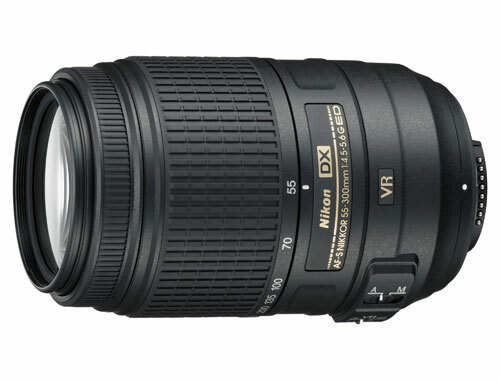 Nikon Corporation is pleased to announce the release of the AF-S DX NIKKOR 55-300mm f/4.5-5.6G ED VR. This DX-format super-telephoto zoom lens covers the 55 mm to 300 mm range of focal lengths and is equipped with Nikon’s latest vibration reduction mechanism, VR II, for simple and enjoyable super-telephoto photography. As a super-telephoto lens covering the 55 mm to 300 mm range of focal lengths, the AF-S DX NIKKOR 55-300mm f/4.5-5.6G ED VR is capable of capturing the main subject at sporting events, indoor events or in vacation photos largely, even from a distance. Equipped with Nikon’s own VR II vibration reduction mechanism, blur caused by camera shake is significantly reduced, even with super-telephoto shooting, allowing users to shoot comfortably and focus their attention on photo opportunities. As Nikon’s first interchangeable lens with a high refractive index (HRI) lens element, this lens is compact and lightweight, making it very portable despite being a super-telephoto zoom lens. This allows users to easily carry the lens with them and enjoy super-telephoto shooting anytime and anywhere. Closest focus distance 1.4m / 4.6ft. Weight Approx. 530g / 18.7oz.